Taken by themselves, the benefits of preschool and early childhood education for children are incredible. Children exposed to a preschool setting are given the opportunity to socialize and learn in ways that many children have to wait until kindergarten to explore. Even more, a preschool education coupled with a music education program is highly beneficial for the children who get to participate in them. Music education helps develop the child’s motor and intellectual skills in ways that far exceed the qualities of normal classroom learning. What are Early Education Music Programs? 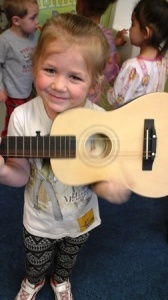 Preschool music programs are designed to give young children their first exposure to music as a way of learning. They are also introduced to music as an object of learning. Your child has no doubt by this stage developed an ear for music and perhaps sings along to their favorite songs on repeat, over and over, much to your enjoyment and exhaustion. The next step is to teach the rudiments of music theory. That is what preschool music programs do. Music education is beneficial and fun!! According to research compiled by PBS, music education imparts a number of positive benefits on all age groups. In preschool age groups specifically, music programs have been shown to develop the part of the brain involved in language acquisition and speech. Language development, the article continues, is essential for proper social development as well. Another benefit of preschool music programs has been revealed in measures of intellect. According to the results of a study conducted by E. Glenn Schellenburg at the University of Toronto at Mississauga, six year olds who were given weekly music lessons showed an increase in IQ test scores over children who did not participate in any music education programs. This should come as no surprise. Neuroscience has discovered that the brain of early musicians works more efficiently than that of a non-musician. Even further, because of the more efficiently functioning brain and neural network of the child exposed to music programs, these children also exhibit improvements in fine motor skills, sound discrimination and spatial temporal skills. All these subtle benefits of preschool music programs are also displayed academically. According to a 2007 study, students who were involved in music education programs scored 22 points higher in English and 20 percent higher in math scores on standardized tests. At Young Scholars Academy of Colorado, we are proud to offer quality preschool and school age programs in the Colorado Springs area. The mighty moves program emphasizes the importance of both exercise and music. Our children become active while dancing to music, learning spatial awareness, how to incorporate your 5 senses, stability, loco-motor skills, object manipulation, all while Learning from our Food Friends how to eat healthy! Come check out all our programs and contact us today!